Okay, so a quick history lesson. In 1985/6, after releasing the Constructicons that combine into Devastator, Hasbro released four sets of ‘Scramble City’ combiners, teams of five where the four smaller limbs can form any arm or leg of the larger super robot. It’s pretty easy to do, since all G1 toys are mostly brickish anyway. One of these teams is the military-themed Combaticons, made up of the missile truck trailer Onslaught, the tank Brawl, the jeep Swindle, the helicopter Vortex and the space shuttle (yeah) Blast Off. Together they combine into big, giant gestalt Bruticus. As part of Generation Two, some toys from G1 get repainted and reissued, among them the Combaticons, repainted in fabulously bright colours with purple camo splotches… which actually look awesome in a sort of way, unlike the rather horrid-looking disco Superion. He’s a “metamorphing dudicus”, as the so-bad-it’s-good G2 rapping advertisement toted him as. The Combaticons had gotten several reimaginations over the years, such as the Energon line, which reintroduced Scramble City, albeit with articulation in the individual members. It’s not outright terrible, but is quite far from being good, since it’s got only two different limbs – a helicopter and a tank – which are duplicated for the others. Sometime later (around 2010) the Power Core Combiners introduced a new iteration of the Combaticons, four nameless drones led by a commander called Bombshock (a homage to a G1 Micromaster) which can combine into a rather Bruticus-esque super robot. It’s not until the new Generations line that a straight-up Bruticus homage is made, however. 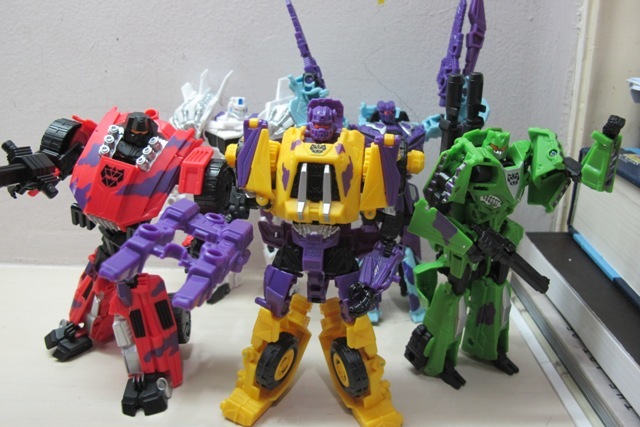 Based on the Cybertronified designs in the videogame Fall of Cybertron, Hasbro released the Combaticons, each of them Deluxe Class toys, and they are able to combine into Bruticus, whilst still being able to transform between a robot and alternate mode… and Hasbro adds in the feature of Scramble City back, and any limb can form either an arm or a leg. It was relatively heavily toted around and excited the fandom for a while. However, Hasbro kind of handled the distribution badly. First, they released the Combaticons in show-accurate (game-accurate) colours in SDCC, basically making the G1 colours – what most the fandom would desire – exclusive to a convention. To the public, Hasbro instead slapped random and aesthetically offensive colours. These second versions of the Combaticons in the retail are sold individually and look horrid. Blast Off is blue and yellow instead of brown, Vortex is raspberry red instead of biege, Swindle is yellow instead of brown, Onslaught is blue instead of gray… the retail Combaticons look simply horrid. And then Amazon released Generation Two-inspired redecoes of the set, based on the G2 colours. When the loud and bright G2 colours look better than the retail colours, you know Hasbro screwed something up. I didn’t plan on getting the Bruticus set at all until I found a half-price G2 Bruticus… and I do quite like the G2 colours, so I bit. And that’s the subject of my review here. So I have done reviews of the individual Combaticons, and for the most part they lean more towards the negative side… which can’t be helped. Combination is fairly complex, and a lot were sacrificed in the design process to make Bruticus look good. 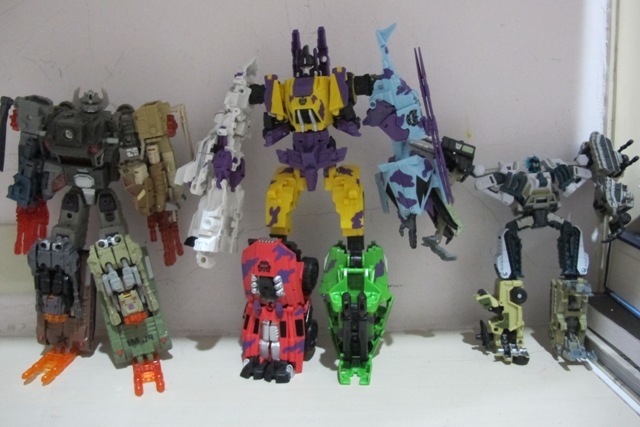 You can read the individual reviews here: Onslaught, Brawl, Swindle, Blast Off and Vortex. This review is about Bruticus and Bruticus alone and barely touches on the individual component robots, so read on to find if the metamorphin’ dudicus is any good. Bruticus’ alternate mode is really the five Combaticons that he transforms into, so read their reviews for my personal opinions on each of them. So in the design process, more thought went to how the toy/toys would work better as Bruticus instead of as individuals. Sacrifices have to be made, such as Onslaught’s both modes being ridiculous. 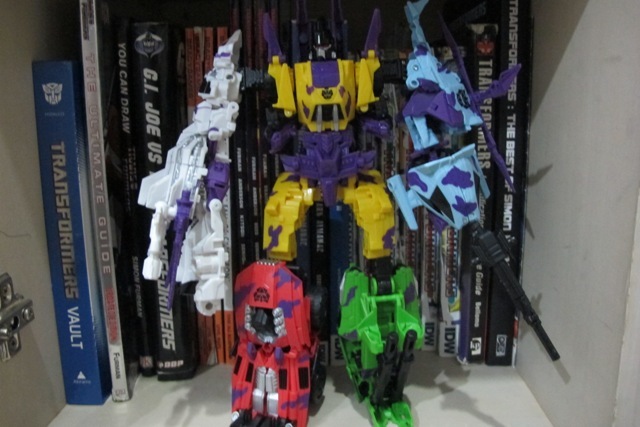 But combined as Bruticus… well, I have to say, Bruticus is far more fun than having the five Combaticons separately. Of course, that isn’t to say that Bruticus is without problems, however. Something that I was worried about Bruticus prior to buying him is how articulated and stable the joints will be, and I’m thankful that Hasbro proved me wrong. The joints are very tight, clamping together very well whilst still retaining freedom of movement. Each of the spots where the robot combines with the central Onslaught body is articulated rotationally, as well as hinged. It means that whichever Combaticons become the arms or legs, Bruticus will definitely be able to rotate his shoulder and will have knee joints. He’s got a hip joint and his head is articulated thanks to Onslaught (and those are probably the only joints Onslaught has that are any good). Again, this allows for considerably dynamic posing. 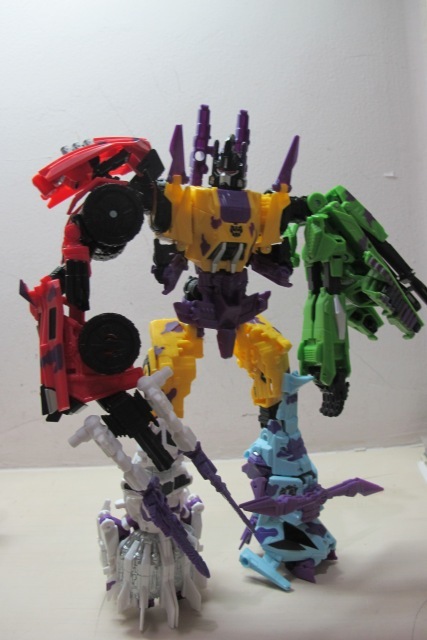 All four of Bruticus’ arms (whichever two you choose) have elbows, with Vortex’s being my favourite. I absolutely love how Onslaught’s legs transform into Bruticus’ thighs. It’s a great transformation, and to help stabilize the giant combiner, there are some pegs and holes in his thighs which lock the thighs into place… but these are very optional, and if you want poses of, say, Bruticus kung-fu kicking or simply raising a giant feet in preparation to stomp small toys, the pegs come off very easily and allow you a veritable range of movement with his thighs. It’s a great touch to put to such a huge toy like Bruticus. Unlike, say, the Aerialbots or Stunticons who appear with alternate configurations all the time, Bruticus normally has a set configuration. Blast Off and Vortex as arms, and Swindle and Brawl as legs. 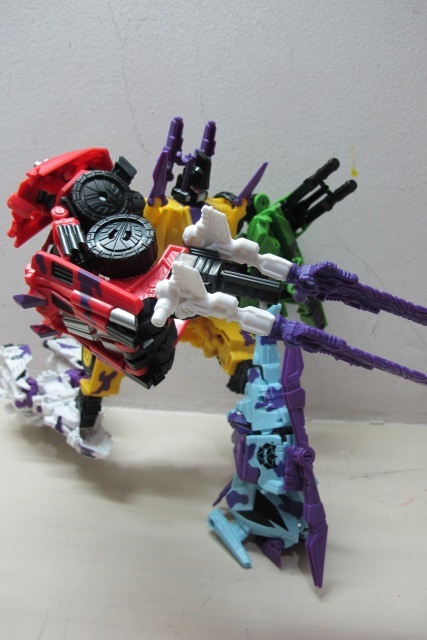 This has quite a bit of sense… both Vortex and Blast Off turn into airborne vehicles, and thus are more able to reach their spots as Bruticus’ arms way up there in the giant robot. This also has the added bonus of having Vortex’s rotor blades on Bruticus’ shoulder, which gives him a distinct silhouette. Of course, this leads to a fair bit of problems. You see… Blast Off is a terrible arm, looking mis-transformed no matter how you put him. See, while the other arms end at Bruticus’ thighs, the Blast Off arm has the elbows at the thighs and the hand end slightly lower than Bruticus’ knees. With the look of the arm (where all the ugly hollow moulding that’s normally hidden being visible) it looks like you can probably fold up Blast Off’s lower legs up and shorten the arm… but this is ridiculously risky since it takes a lot of forcing to get it into that position, and will ruin your Blast Off with stress mark if not break it outright, so I don’t recommend it. The other way is to obviously swap round the arms and legs. Thankfully all four make great, stable legs (Brawl’s the weakest, although despite being weak he’s still pretty stable), but it just doesn’t feel quite right when Bruticus’ limbs are swapped around like that. Still, Brawl and Swindle both make decent arms, and once you get past the oddity of the limbs being switched around Bruticus is still a pretty good-looking gestalt. Which brings me to the second problem: nobody but Swindle has decent hands. Vortex has his in this weird kung-fu pose thing. Blast Off’s is a nice, neutral clenched fist, but he’s a terrible arm. Brawl’s is a very odd-looking flat… thing that barely passes off as a hand. It’s kind of irritating, really. At least Vortex’s karate hand has a fist-hole, so you can peg in Bruticus’ weapons and get rid of the silly-looking karate chop hand by covering it under Bruticus’ weaponry. The main reason is the fact that all of the hands have thumbs that switch over, making Bruticus’ non-Swindle hands all look awkward. With the G2 colours he looks pretty great. The purple across all five Combaticons really do a good job of integrating the five wildly different primary colours. It really looks pretty good. The weakest point is probably the rather messy Blast Off, which is very plain and white to boot. Bruticus can combine all of the weapons from his component parts, although I’ve always left Onslaught’s double-barreled cannon attached to Bruticus’ back. It gives him a better back profile, and besides Bruticus’ twin cannon deal is another aspect of his iconic silhouette as well. I really like how Swindle and Brawl’s guns attach to form a longer gun… but I really think the fact that Blast Off and Vortex’s weaponry look… out of place attached to the sides of the long rifle. 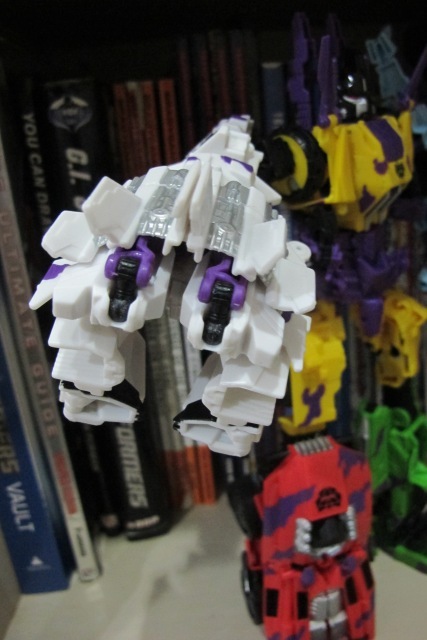 Blast Off’s guns, in particular, look ridiculous being white, and stand out sorely if held by a non-Blast-Off limb. A lot of people really like the giant combined gun, which I suppose is cool, but I personally am very indifferent to them. Of course, you can attach the weaponry elsewhere. 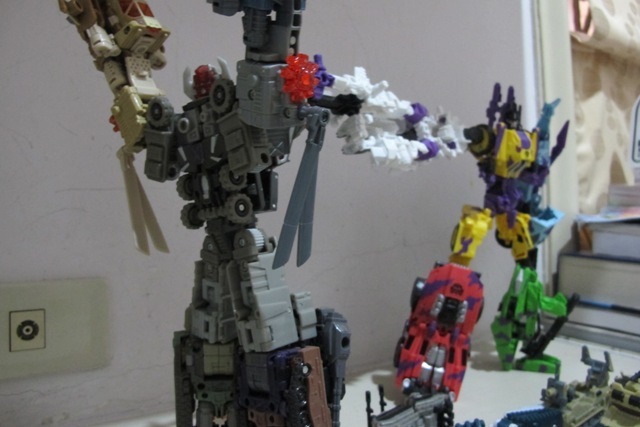 Bruticus could hold a two-ended Gigatron-style blade with Vortex’s weaponry. Blast Off’s guns could attach as wrist cannon deals on the Blast Off arm, or toe-cannons if he’s a leg. You can even fold out Onslaught’s robot mode arms and give him two guns to hold, making Bruticus four-armed in the vein of Monstructor. In the game Bruticus can transform the Blast Off arm into a flamethrower, and I suppose you can make an approximation of that with the toy if you fold the lower arm into the upper arm. 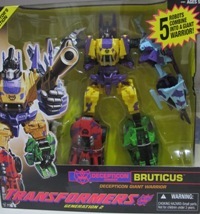 Bruticus is not exactly show-accurate. If you take a look at the official art, they go the ‘additional kibble’ route that the original Bruticus toy did, and added some kind of winged chest-guard which the toy attempted to very weakly replicate with flip up purple parts. So instead toy Bruticus has Onslaught’s chest instead. Also, you can notice that Blast Off has his kibble in all the wrong places, and the feet are all different as well. Can’t be faulted, though… it takes a lot of work to make the design realistic, and the toymakers can’t rely on CGI magic like the game makers did. Bruticus makes a really fun toy, and it’s rather nice to pose him destroying Autobot forces, something that I don’t think the original Bruticus toy is able to do. Basically… Bruticus is a great gestalt. The first properly articulated gestalt, too. He’s a great combiner, with half-decent components (bar Onslaught). However, Hasbro really needs to step up their game if they are planning any more combiners down the road. This one barely passes the realm of ‘good toy’. Transformation Design: 6/10 Some parts of Bruticus are really well-designed, but some, like Blast Off and Brawl, simply leaves you questioning why Hasbro didn’t refine their transformations before releasing the toys into retail. And then there’s the factor that Onslaught got totally shafted because he had to transform into Bruticus’ torso. It all averages out a five or a six in my opinion. Durability: 7/10 Bruticus feels a bit flimsy, and some parts of him (Onslaught’s cannons in particular) have shown signs of stress marks. Signs of cheap plastic usage perhaps? He’s otherwise pretty sturdy, though. Aesthetics: 6/10 Show-inaccuracies aside, Bruticus really looks great, especially in the awesome-looking Generation Two look. Again, there are some things like the overly long Blast Off arm that kind of ruin Bruticus. Articulation: 8/10 Surprisingly for such a large gestalt, Bruticus is pretty well articulated. He’s got joints everywhere you’d expect him to be. With the exception of the rather sub-par arms, Bruticus is pretty damn articulated. Fun: 8/10 As a combiner, he’s pretty fun. Combine him! Switch out the limbs! Figure out where the weapons fit! Split him apart! Transform the members! It’s a shame his components are pretty sub-par, or he’d be much better. Value/Price: 2/10 I definitely do not recommend Bruticus. He’s got a lot of problems, his components are sub-par toys, and at retail price, he definitely is not worth the money. Overall: 6/10 Bruticus is a great set and a daring accomplishments. Other reviews out there tote him as either the best thing ever or a horrid mess, and I think he fills both categories adequately, rounding up somewhere in the middle. On one hand, he’s a very great gestalt and the combination gimmick is handled exceedingly well. On the other hand, bar Swindle all the gestalt component members suffer from some problems in design. It’s a great effort, but make no mistake – Bruticus is more akin to a trial run to hopefully better gestalts in the future.